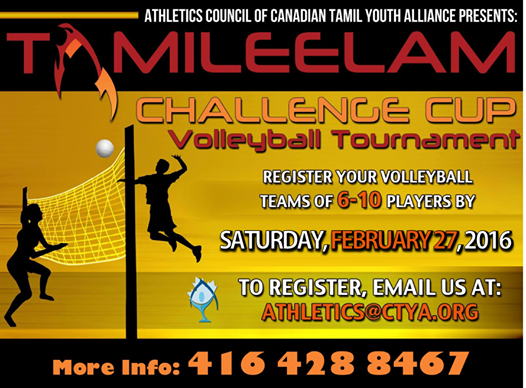 The battle to crown the new Tamileelam Challenge cup Champion is fast approaching, as the Athletics Council of CTYA are going to be hosting the 2016 Volleyball Tamil Eelam Challenge Cup. We welcome everyone to the tournament and we are looking to have teams from 6 to 10 players. If you wish to register a team, please email: athletics@ctya.org or contact 416-428-8467. Registration is open untilSaturday, February 27th 2016. The Tamileelam Challenge Cup gives a great opportunity to maintain our identity through sports. It is an excellent way to encourage our youth to promote and showcase their talents and skills. To further support the Tamil identity, the awards for best players of the tournament will be given under the names of national symbols of Tamil Eelam; Vaahai being the national Tree; Siruththai being the national animal; and Chenbagam being the national bird. CTYA’s Athletics Council takes the pride in providing Canadian Tamil youths with the chance to develop their leadership skills through athletics and recreational programs. The goal of this council is to coach through athletics, promote exceptional sportsmanship and build team spirit. This entry was posted on Friday, February 12th, 2016 at 10:48 am	and is filed under Athletics/Sports, Cafe, Uncategorized. You can follow any responses to this entry through the RSS 2.0 feed. You can leave a response, or trackback from your own site.